2-in-1 Foldable Tripod & Stand for iPhone / Sony / Samsung / HTC / LG / Xiaomi / Alcatel Smatphones [AP002823] - $0.95 : allputer.com - Accessories for all your Portable Electronics & Computers! 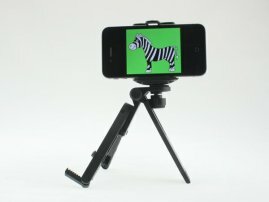 This kit is a mini Tripod for your Smartphones (not for Tablets) and as the same time, it is also a Mini Stand for your Smartphones / Tablets. It can help you to mount your smartphones for phototaking and you can also use 2 of the legs to rest your tablets / smartphones on (see pictures). Whenever you don't use it, just fold it and put it into your pocket! It is easy and convenient. - Provide a solution to cellphone photography. - Easy to install and durable. - No Phone or Tripod will be included. - M6 or Diameter 1/4" (1/4"-20" or 1/4-20) thread. - Compatible with Camera phones width between 45mm ~ 65mm.